Project of the Month and Award Winning Central Park in Glen Oaks | Goldberg & Rodler, Inc.
Goldberg & Rodler has won a LINLA Gold Award and a NYSNLA Environmental Beautification Award for the Central Park we designed and installed at Zucker Hillside Hospital – Northwell Health’s nationally recognized behavioral health center. 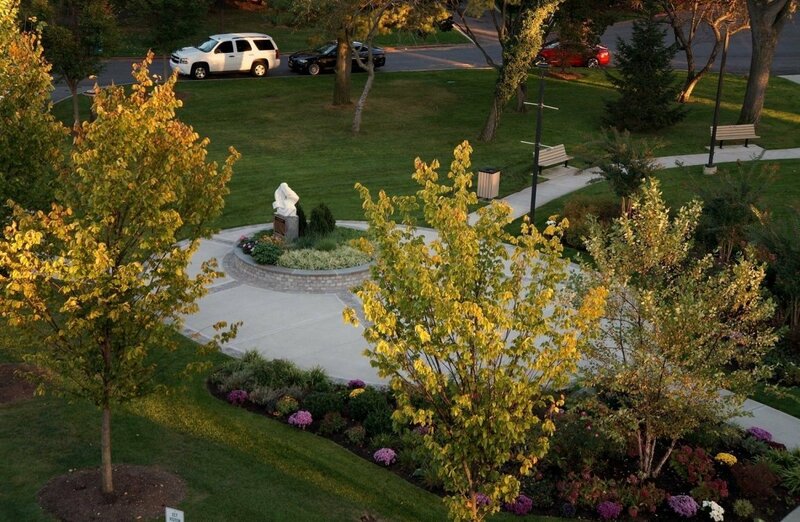 This hospital campus is a renowned psychiatric facility in Glen Oaks, New York. The hospital administration requested a park-like concept that provides beautiful views and outdoor experiences for the employees, doctors, outpatients, family members and friends visiting with patients. Interaction with nature is one of the hospital’s earliest tenets. When the facility was founded in 1927 therapeutic gardening was one of the original supporting activities and current patients continue the tradition of growing and caring for flowers that are planted throughout the campus. We became involved in making site improvements in the early 1960’s and have been helping the hospital grow and improve while keeping these core values intact. The newly created open space once had a series of cottages, used for permanently admitted patients to receive therapy, which were in a state of disrepair. The removal of these cottages provided the canvas for the realization of Central Park in Glen Oaks. 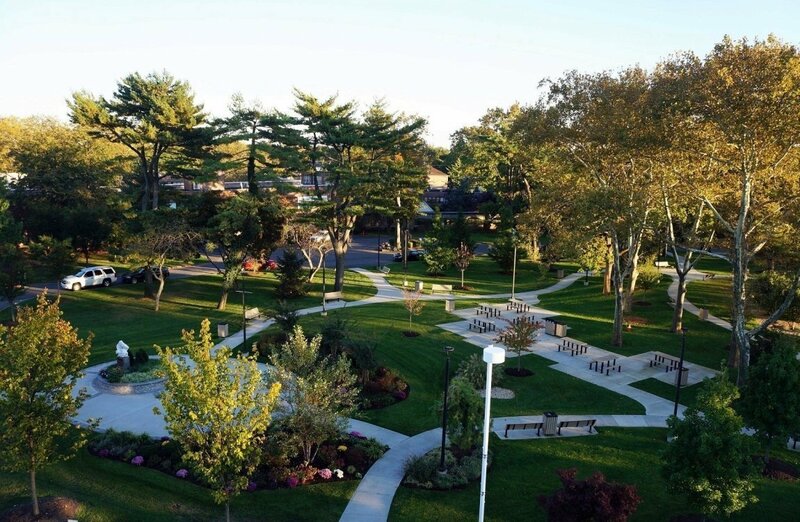 This park provides staff with areas of respite during their hectic schedules of caring for others and a functional way to get from point A to point B while enjoying this centrally located park-like setting. Benches are in strategic locations for both solitary and social opportunities. Trashcans and recycling bins with secure lids are provided throughout the park along the walks and in the dining terrace to reduce litter, deter foraging animals, and promote a clean environment. An integrated dining terrace is nestled under mature Sycamore trees. 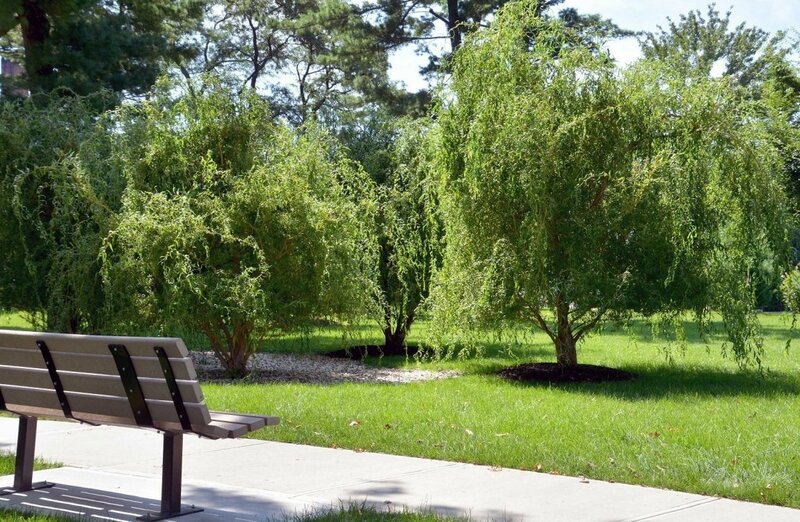 These stately trees provide shade for employees taking a break during the warmer months. The terrace improves the sense of place where an asphalt ambulance parking lot and the dreary cottages once stood. 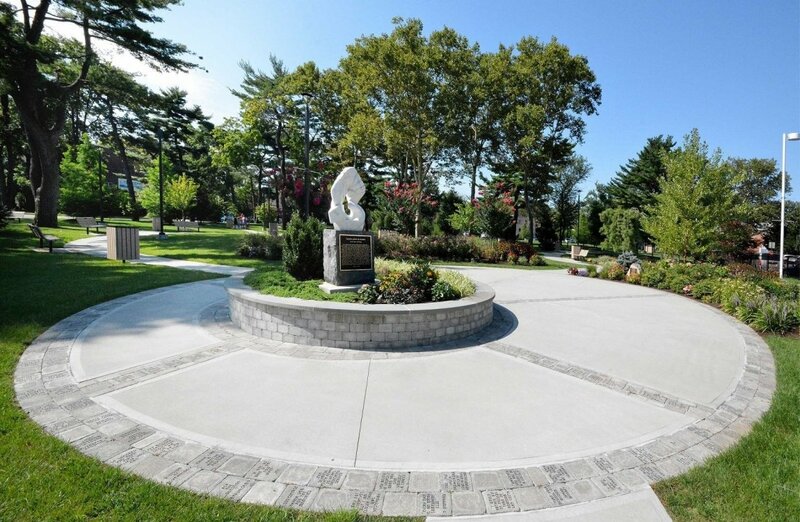 The central plaza has a raised masonry planter that displays a marble sculpture crafted by an artist with very close personal ties to the facility. We worked closely with the artist to ensure this tribute piece is a focal point. Precise coordination with the transport company was essential to get the marble sculpture shipped from Colorado and installed with a crane on a specially engineered concrete footing. The main plaza borders and inlays are engraved pavers, which we coordinated with the hospital as part of a fundraising drive. They consist of inspirational sayings, memorial tributes, and messages of hope. The plaza is a space to contemplate and gather as part of the healing community. We planted a diverse selection of trees in the central core of the campus. Flowering trees include Eastern Redbud to usher in spring. Japanese Dogwood and a small Japanese Cherry grove compliment the 60+ year old trees we installed on the campus previously. Crape Myrtle offers late summer color and Witch-Hazel gives a bright yellow pop at the end of gray winters. Red Maple, Dawn Redwood, White Pine, River Birch, and Curly Willow are dispersed throughout the park and will enhance the existing Pine, Sycamore, and Oak canopy as they mature. Hybrid American Elms line the drop off area in front of the new building and frame the north side of the park. 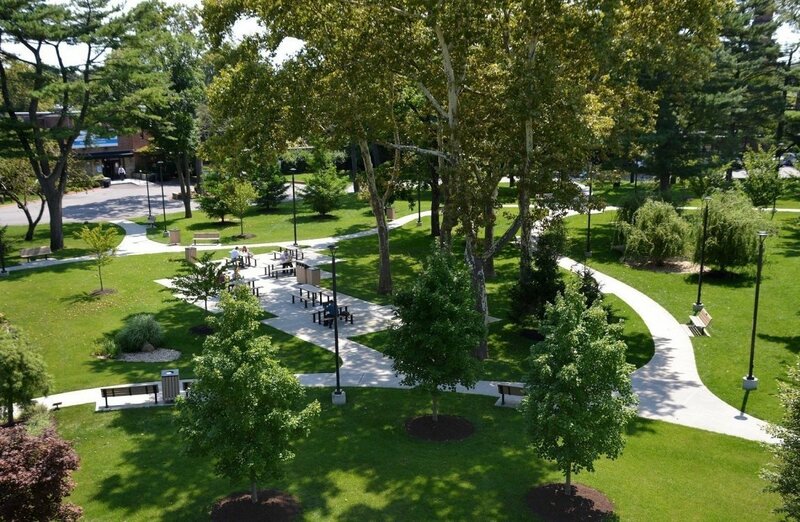 The newly designed central green space contains programmed and spontaneous recreational areas with ADA accessible concrete walks that wind through the park and connect various points of the campus. Many administrative offices are located in basement levels of the buildings and some have no windows. The open lawn areas in the park create an oasis of open space and are large enough to accommodate tents for special events at the hospital such as Nurses Appreciation Day, training sessions, outdoor meetings and the annual employee picnic. Drainage remediation strategies were introduced to counteract years of compacted poor soil conditions from previous infrastructure and became an important consideration in the design. Decorative and functional gravel infiltration areas with Corkscrew Willows help to direct water away from gathering areas. Prior to construction, we contracted a private professional markout service to locate all underground utilities. This task was extremely important because this mature healthcare campus contains active oxygen lines, concrete vaults, electrical lines, telephone, cable, alarms, and other vital utilities. Lighting this facility is no small feat and is necessary to create a safe and navigable environment in this 24 hour facility. The 2 story light posts throughout the park are mounted on engineered reinforced concrete bases and are triggered by solar cells when the sun sets. Trenching for the line voltage conduits was a delicate production that involved maneuvering around all of the existing underground utilities and hand digging when necessary to avoid disruption to essential medical care. The new park setting is a hub of activity. Pedestrians circulate safely, employees dine, and visitors sit and reflect in a serene environment. The transition from tired old cottages to a new vibrant space provides a great user experience and is a tremendous asset to this facility.